The San Patricio Municipal Water District purchases water through long-term contracts with the City of Corpus Christi which manages the regional water supply system. The District provides potable drinking water to municipal customers. 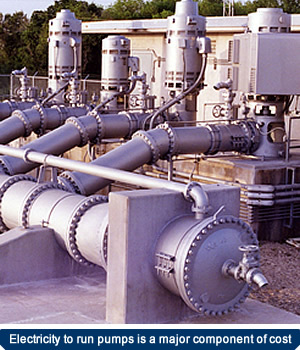 It provides various grades of treated water and untreated water (raw water) to industrial customers. Water rates are set by the District Board of Directors based on the cost of production and delivery. Costs include the water purchased from the regional system, debt payments on District projects, electric energy for pumping, recurring operations, maintenance and administration. Every customer pays a full and equal share of the cost of raw water from the regional system, regardless of where the water originates. Other costs are allocated using a comprehensive cost model and then allocated to production units to establish the cost of service for each grade of water delivered. City water departments and districts buying drinking water from the District all pay the same water rate. Industrial customers contract with the District and pay the full cost of producing and delivering the grade of water they require.